The kitchen is known as the heart of the home. You spend a lot of time in there preparing, cooking and entertaining. 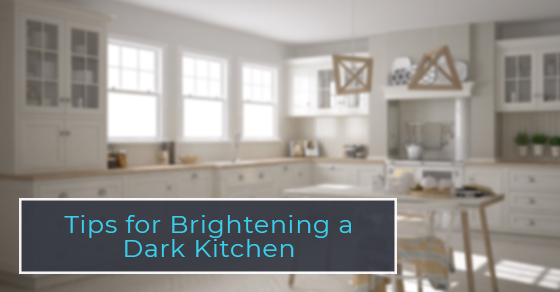 If your kitchen is a dark room in your house, here are some tips to help you brighten up the space. Using bright and cheerfully-coloured elements in your kitchen can make the room feel brighter. This could be as easy as adding a wall hanging or some fresh flowers. Depending on your kitchen, during your home renovations, you may consider painting one wall a bright colour such as yellow or pink to add some light to the room. During your home renovations, you can also add a brighter feel to your kitchen by installing a new, lightly-coloured countertop. The best colours to use are white, tan or light gray. Changing the look of your cabinets can go a long way to creating a brighter feel to your room. If you opt to put in new ones, go with white or light-coloured wood cabinets. If you are not ready to replace your cabinets, you can lighten them up with a fresh paint job. The floor is a key element that will reflect the light in the room and help brighten up a dark kitchen. If you are looking for something that is easy to maintain, go for a low-sheen option. Selecting a backsplash that adds a little shine to the room is a great way to brighten the space. The best choice would be a polished glass or white tiles. Appliances that shine, such as stainless steel, will help lift the darkness of any kitchen. You can also incorporate shiny metal accents around the room to add more reflective surfaces into the space. In dark kitchens, it is important to keep the window area as uncluttered as possible. When you are doing home renovations, don’t block the light with appliances or units that will minimize the natural light flowing through. If your kitchen doesn’t get enough natural light, you may want to consider adding more fixtures. Having extra lights installed underneath the cabinets will help take the darkness away. Using light fixtures that hang away from the ceiling and bring the light closer can also help a kitchen feel brighter. There are many ways to add some light to your kitchen with a few simple home renovations. As it is one of the most important rooms to your home, a brighter kitchen will make you and your guests feel a little brighter too. For more information about home renovations, call Avonlea Renovations at 416-907-7891 or contact us here.